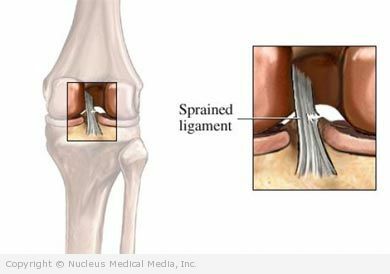 A knee sprain is stretching or tearing of the ligaments that support the knee. Ligaments are strong bands of tissue that connect bones to each other. Knee sprains are graded according to their severity. The more ligaments that are involved means the more severe the injury. Rest — Avoid putting any pressure on your knee by not walking on that leg. Ice — Apply ice or a cold pack to the knee for 15-20 minutes, four times a day for two days. This helps reduce pain and swelling. Wrap the ice or cold pack in a towel. Do not apply ice directly to your skin. Compression — Wrap your knee in an elastic bandage (eg, Ace bandage). This will limit swelling and provide some support for your knee. Be careful not to wrap the bandage too tight. Elevation — Keep the injured knee raised above the level of your heart. Do this as much as possible for 24 hours or so. This will help drain fluid and reduce swelling. For severe sprains, you may need to do this for a couple of days. Brace — You may need to wear a brace. Your doctor may also recommend that you wear a brace when you return to sports. Although, the American Academy of Pediatrics recommends that children do not use braces. Leg cast — If you have a severe sprain, you may need to wear a short leg cast for 2-3 weeks. Rehabilitation exercises — Ask your doctor about exercises to restore flexibility, range of motion, and strength. 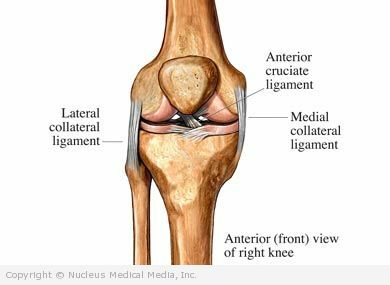 Surgery — This may be needed if a ligament is torn completely. Learn the proper technique for sports and exercise. This will decrease stress on all your muscles, ligaments, and tendons, including those around your knee. Also, wear the proper equipment.